To make an apology effective we must validate the pain we have inflicted. We validate pain by feeling what they feel. In other words, if they feel disappointed and betrayed, we must feel the same. Only by “putting ourselves in their shoes”, can we truly understand what they are feeling. We can articulate our understanding of the pain we helped create by “speaking to the pain.” Example: “I can see how you would feel disappointed and betrayed.” By speaking the words that accurately describe the type of pain, we show that we truly do understand how much we have hurt them. Also notice that there’s no mention of a request for forgiveness. 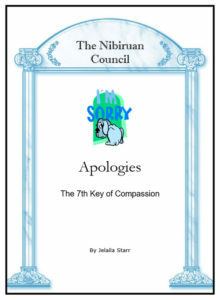 We give the apology and acknowledge our actions and then let them decide whether they are willing to release us from blame. We must carry the responsibility of our actions until they decide to look for how they might have co-created the experience and take responsibility for their part. If I received an apology such as the example we used, I’d know that I had been heard and that the person who hurt me really understood what they had done and that they wanted to make restitution for the pain. I would feel honored and valued and loved by this person. Furthermore, I would feel that I could trust them to acknowledge and take responsibility for their actions. It’s a relationship I would value and strive to maintain. So far, I’ve given you the intellectual information on effective apologies. As you are probably already aware, stories bring intellectual concepts to life. Below is a real life story that occurred between my husband, Jonathan and me. In fact it was the conflict that really brought the whole idea of effective apologies to light.